I know, I know, here we are the week before Thanksgiving and I’m supposed to be writing about some new, inventive way to cook your turkey or this clever new side dish to serve next to it, or here’s this innovative way to make pumpkin pie! Sorry, but I’m a wee bit preoccupied with these tomatoes right now. They’ve sort of become an obsession of mine recently, and sadly, I haven’t found a way to work them into my Thanksgiving dinner. But let’s talk about Thanksgiving for a minute, since that’s what's expected. It’s without a doubt my all-time favorite culinary moment of the year. I love making the dinner, I love eating the dinner and I totally love the leftovers. But it’s not a meal that I use as a springboard for creativity and innovation. Nope. I’m an old school traditionalist when it comes to Thanksgiving and I make no apologies for it. These are flavors that need no tweaking, so I will roast my turkey (20lb) the same way I do every year (rubbed and basted with butter and my Tuscan Herb Salt), stuffed with traditional bread stuffing and served with my homemade gravy, mashed potatoes, sweet corn pudding, homemade dinner rolls, Mom’s cranberry sauce and sautéed green beans topped with caramelized shallots, and sometimes Mom will bring her candied sweet potatoes (no marshmallows!). This will be followed by pumpkin pie and perhaps an apple or brown sugar pie, whipped cream or ice cream as might be appropriate. Every year it tastes better than the last, and we like that and steadfastly refuse to change a thing. and are just way nicer than you would expect tomatoes to be this time of year. But really, you don’t have to have great tomatoes for this; if they’re not terribly tasty when you buy them, they will be when we get through with them. or a scrumptious pesto. We put them inside flatbread meatball sandwiches, stuffed inside an omelet filled with goat cheese and herbs, or melted down with some creamy mozzarella cheese on crusty bread or whirred in the blender for a richly decadent sauce for pasta or pizza. 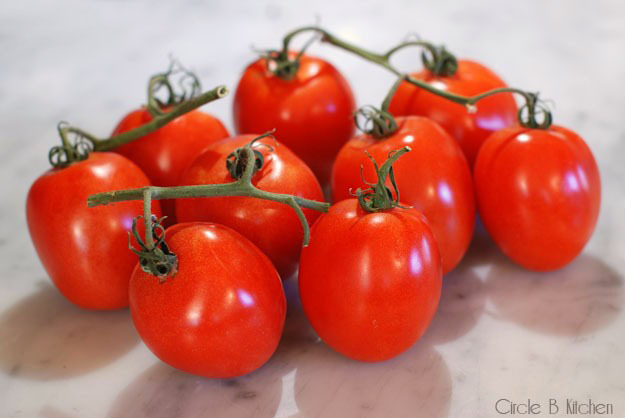 Most of those dishes will feature prominently in upcoming posts, so it’s best if you get these tomatoes all roasted up and stashed in the fridge. What follows is the recipe as published by Bon Apetit. As usual, I did not exactly follow said recipe, but mostly I did. Firstly, I did not use an entire cup of olive oil. At the most I used maybe 1/3 or ½ cup. I did not do the layering step (#3), although I’m sure that would be delicious. After roasting, I let the tomatoes cool and proceeded to use them as mentioned in the blog. As far as seasoning goes, I substituted the oregano with 3 teaspoons of my Tuscan herb salt and then sprinkled them with a bit more salt to finish. 1. Preheat oven to 250°F. Pour 1/2 cup oil into 13x9x2-inch glass or ceramic baking dish. (I just drizzled the bottom of the dish with enough oil to coat). Arrange tomatoes in dish, cut side up. Drizzle with remaining 1/2 cup oil. (Again, I just drizzled the tomatoes with enough olive oil to moisten them). Sprinkle with oregano, sugar, and salt. (I sprinkled them with 3 teaspoons of my Tuscan herb salt and then maybe just a bit more kosher salt). Bake 1 hour. 2. Using tongs, turn tomatoes over. Bake 1 hour longer. Turn tomatoes over again. Bake until deep red and very tender, transferring tomatoes to plate when soft (time will vary, depending on ripeness of tomatoes), about 15 to 45 minutes longer. 3. 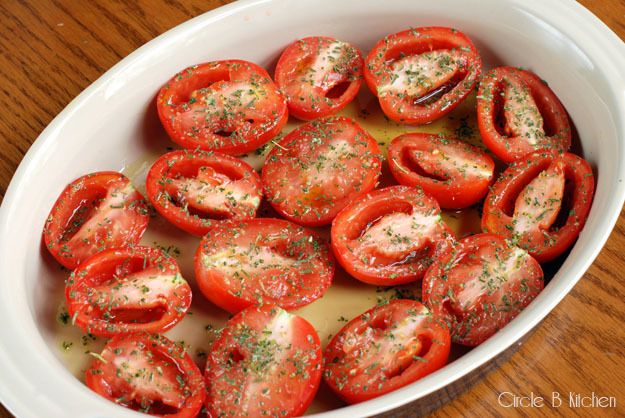 Layer tomatoes in medium bowl, sprinkling garlic and parsley over each layer. Drizzle tomatoes with the reserved oil , adding more if necessary to cover. Let stand at room temperature 2 hours. DO AHEAD Cover; chill up to 5 days. Bring to room temperature before serving.